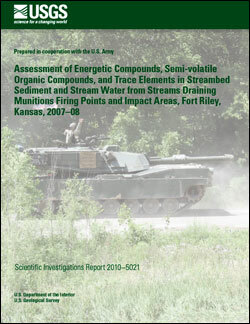 An assessment of energetic compounds (explosive and propellant residues) and associated semi-volatile organic compounds (SVOCs) and trace elements in streambed sediment and stream water from streams draining munitions firing points and impact areas at Fort Riley, northeast Kansas, was performed during 2007–08 by the U.S. Geological Survey (USGS) in cooperation with the U.S. Army. Streambed sediment from 16 sampling sites and stream-water samples from 5 sites were collected at or near Fort Riley and analyzed for as many as 17 energetic compounds, 65 SVOCs, and 27 trace elements. None of the energetic compounds or SVOCs were detected in streambed sediment collected from sites within the Fort Riley Military Reservation. This may indicate that these compounds either are not transported from dispersal areas or that analytical methods are not sensitive enough to detect the small concentrations that may be transported. Concentrations of munitions-associated trace elements did not exceed sediment-quality guidelines recommended by the U.S. Environmental Protection Agency (USEPA) and are not indicative of contamination of streambed sediment at selected streambed sampling sites, at least in regards to movement from dispersal areas. Analytical results of stream-water samples provided little evidence of contamination by energetic compounds, SVOCs, or associated trace elements. Perchlorate was detected in 19 of 20 stream-water samples at concentrations ranging from an estimated 0.057 to an estimated 0.236 µg/L (micrograms per liter) with a median concentration of an estimated 0.114 µg/L, substantially less than the USEPA Interim Health Advisory criterion (15 µg/L), and is in the range of documented background concentrations. Because of these small concentrations and possible natural sources (precipitation and groundwater), it is likely that the occurrence of perchlorate in stream water is naturally occurring, although a definitive identification of the source of perchlorate in stream water at Fort Riley is difficult. The only SVOCs detected in stream-water samples were bis(2-ethylhexyl) phthalate and di-n-butyl phthalate but at concentrations substantially less than the most stringent aquatic-life criteria established by the Kansas Department of Health and Environment. All trace element concentrations in stream-water samples were less than the most stringent aquatic-life criteria. The implication of these stream-water results is that contamination arising from firing-range activities, if it exists, is so small as to be nondetectable with current analytical methods or is not distinguishable from background concentrations for constituents that also are naturally occurring. Overall, the munitions-related constituents analyzed in streambed sediment and stream water, when detected, were at concentrations that were less than regulatory criteria. Coiner, R.L., Pope, L.M., and Mehl, H.M., 2010, Assessment of energetic compounds, semi-volatile organic compounds, and trace elements in streambed sediment and stream water from streams draining munitions firing points and impact areas, Fort Riley, Kansas, 2007–08: Reston, Virginia, U.S. Geological Survey Scientific Investigations Report 2010–5021, 55 p.